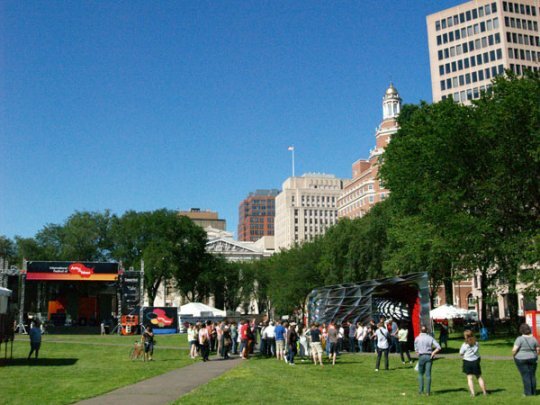 For two weeks each summer, thousands of people flock to New Haven, Connecticut to experience the International Festival of Arts and Ideas. Music, dance, theatrical performances, lectures, exhibits, and conversations take place in open spaces and theaters around the city, celebrating artists and thinkers from around the world. At this year's festival, Young Audiences Connecticut hosted two events on the New Haven Green, designed to engage children and families in the art of improvisation and music. On Sunday afternoon, an improvisational theater company made a crowd of 50 children giggle with their interactive performance, Theatersports. Actors Mike Durkin, Laura Livingston, Laura Valpey and Kristie Wortman first solicited suggestions from the audience, then acted out the kids' ideas. Suddenly, at the sound of a bell, they switched from speaking in English to speaking in gibberish, creating silly scenes made up on the spot. Freestyle Rep is about more than just making kids laugh, however. Throughout the performance, kids got a chance to get up onstage and help act out their scenes, helping build their confidence and teach them principles of improvisation and theater. One of the most important elements of drama is the interaction between characters and the way they communicate. While speaking gibberish, the actors needed to use non-verbal cues and body language in order to create a scene. Even without a common language or a complicated plot, the key ingredients in drama are the relationships between characters. The musicians of Crocodile River Music took to the Festival's Family Stage on Friday, to teach families about West African history, instruments, and song. The group has been providing lessons, music workshops, and artist residencies since 2010, sharing their music with thousands of New England residents. The group played 1950s calypso, Harry Belafonte tributes, African diasporic melodies from Brazil and the Caribbean, and traditional African drum rhythms, filling the tent with music and dance. The performance jumped seamlessly from music to education: a drummer outlined the history of the djembe drum while demonstrating its sound, and a singer explained the importance of Malian praise songs before launching into his own soaring rendition.